Getting in late from Santorini left me more than a little tired the next day. I was glad I had not scheduled much for that Friday. My goal was to get packed and ready to leave as I would be very busy on Saturday and Sunday. I would have to leave for the airport at 5:30 a.m. on Monday, so there would be little time to get things together otherwise. Got up and to the breakfast room of the hotel just in time to grab a quick meal. 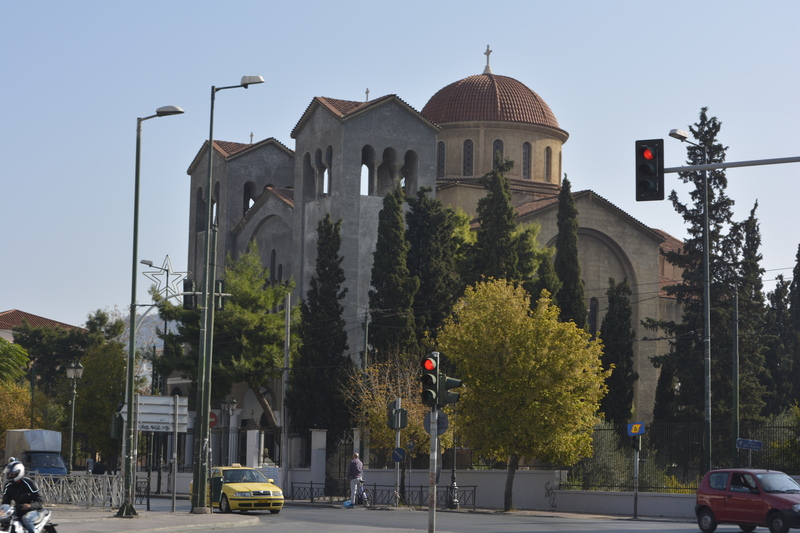 The weather, as usual, was great so I decided to walk through an area of Athens I had yet to explore. I left the Apollo Hotel and headed down Alexandron Street. 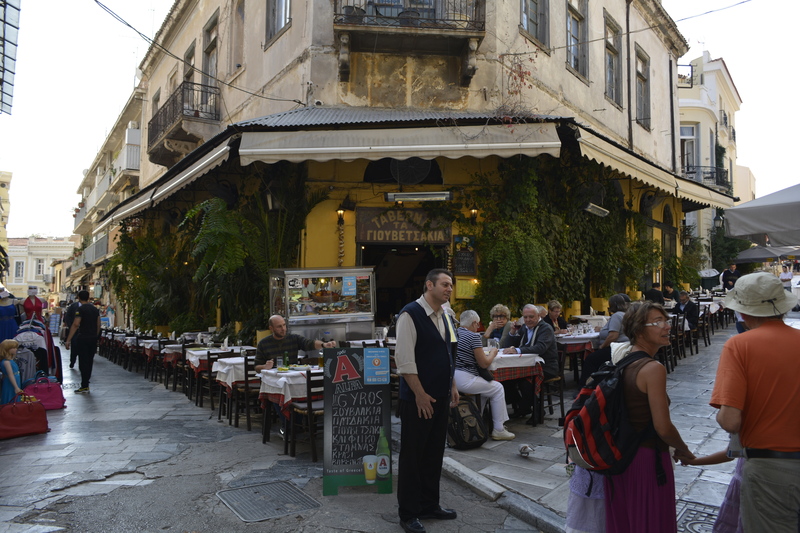 As you get away from the center of Athens, this street takes on a lot of charm! The side-streets become narrower and tree-lined. This must be a cheaper area to live as it seems like a lot of pensioners live here. Also being less expensive, there are a good number of students as well! The area takes on a decidedly artsy air. There are many small shops with elderly men just taking in the morning with a cup of coffee or tea while reading the newspaper or catching up with old friends. There is a theatre further down that was having an international short film festival. I would have loved to go, but it was the last day of the festival, and I had only that day to wander the back streets in Athens from this direction. 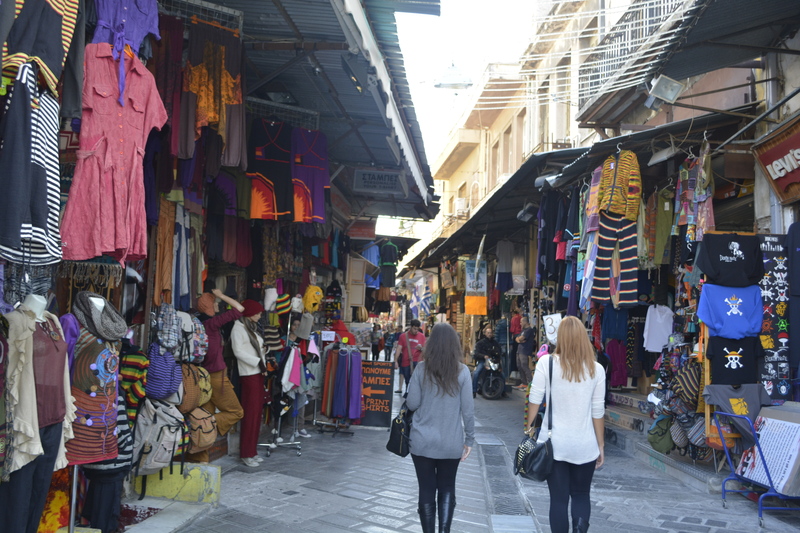 I eventually ended up in the area to the west of the Acropolis, a very livable area of small, quiet streets. I wandered through these lanes filled with second-hand shops. You would have to know your stuff not to get ripped off in this emporium! 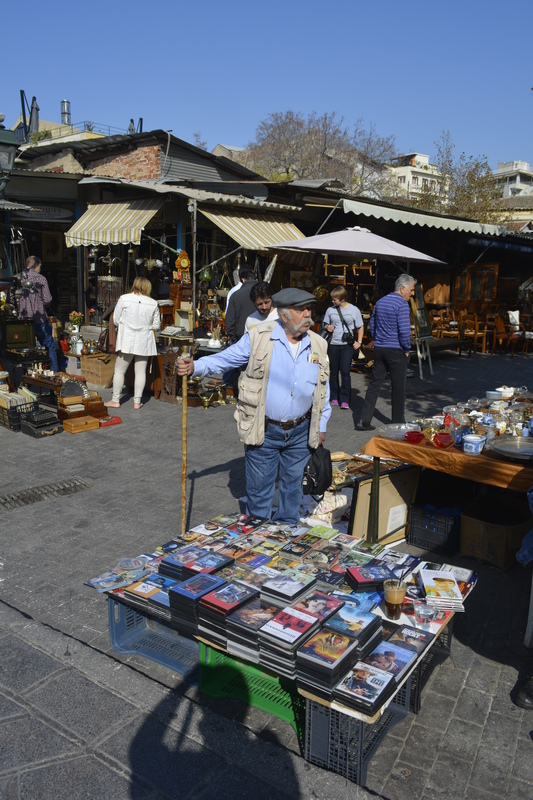 I watched as people haggled their way in Greek and English trying to negotiate the best price for antiques, or objects made to look that way! 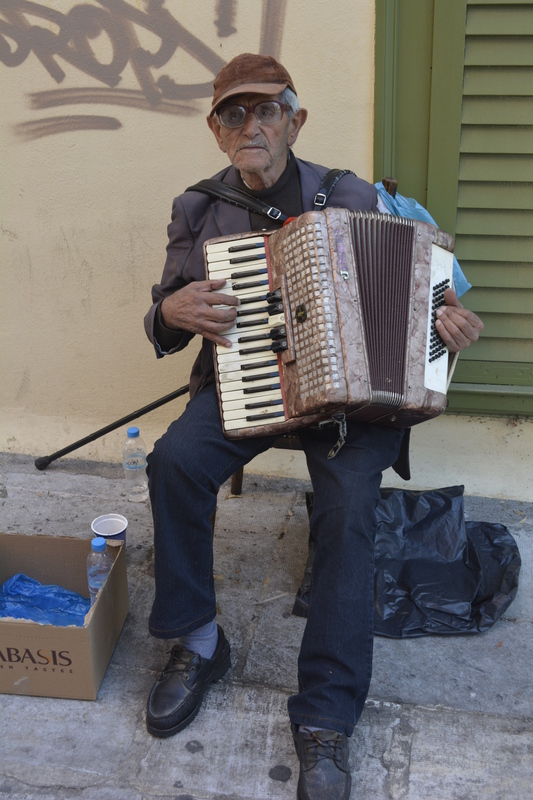 There were musicians and odd characters wandering the lanes which added to the energy of the place. I stopped in a shop that sold handmade crafts. The shopowner was a very animated and interesting woman. She was selling “kam-ba-loy” beads. I saw these beads strung together in Istanbul, Thessaloniki and Athens. 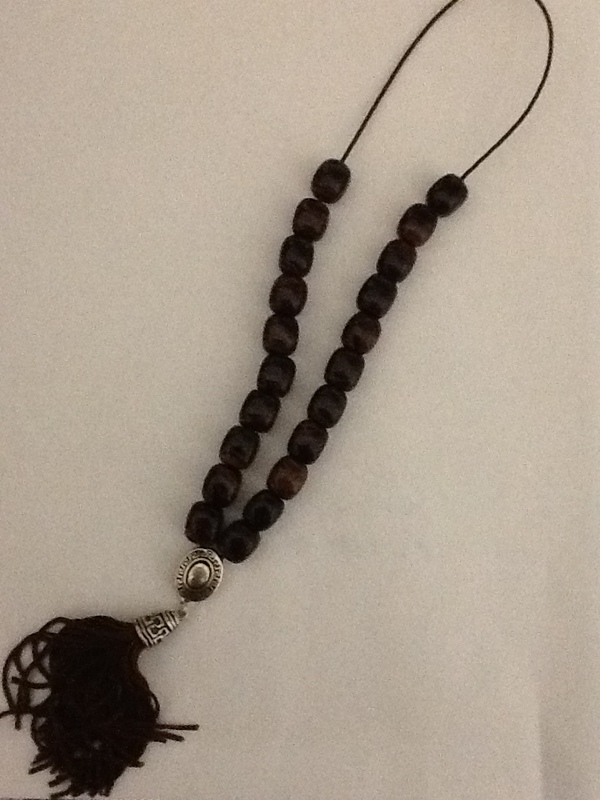 I thought they were prayer beads as I would see men sitting or walking using them. The woman explained that they are actually worry beads. Men use them to distract themselves when they a re nervous or just have nothing to do! At late afternoon, I was at the old Greek Agora. 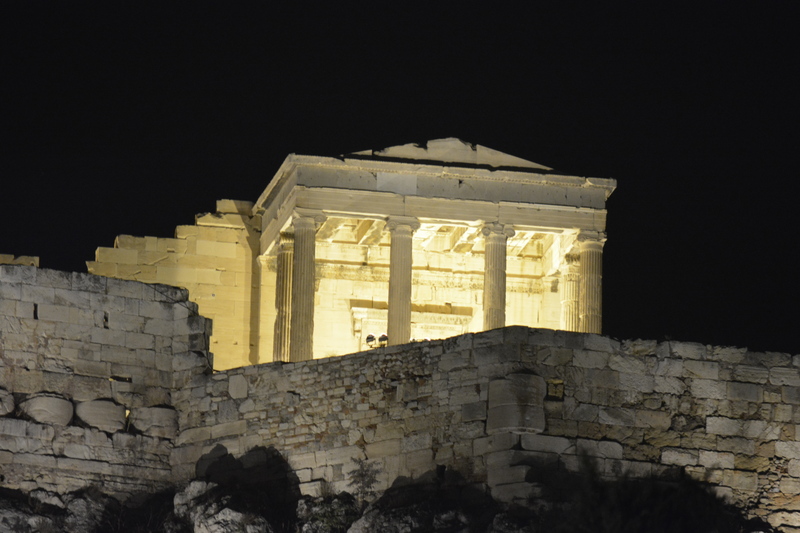 I had two entrance tickets left on my pass, so I entered and walked the pathways again taking pictures of the Acropolis as nightfall came. 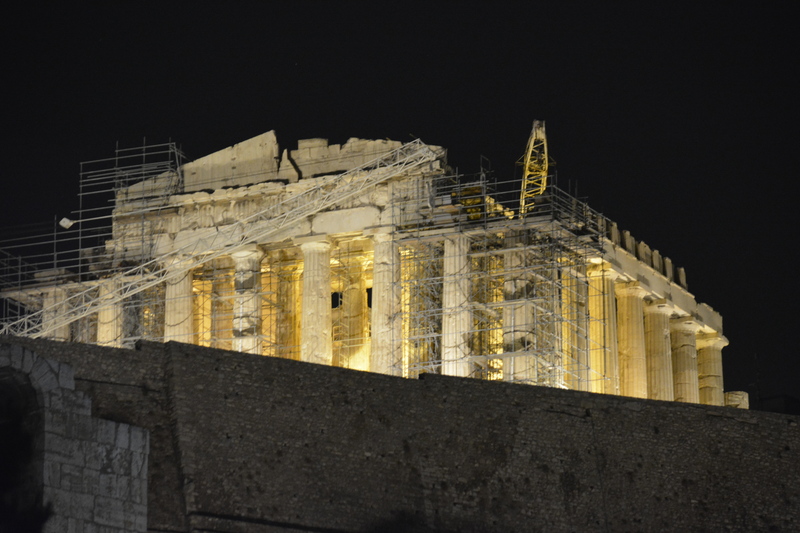 I then took a last walk around the base of the Acropolis, and had dinner at a restaurant on the Plaka. A nice way to say goodbye to Athens. 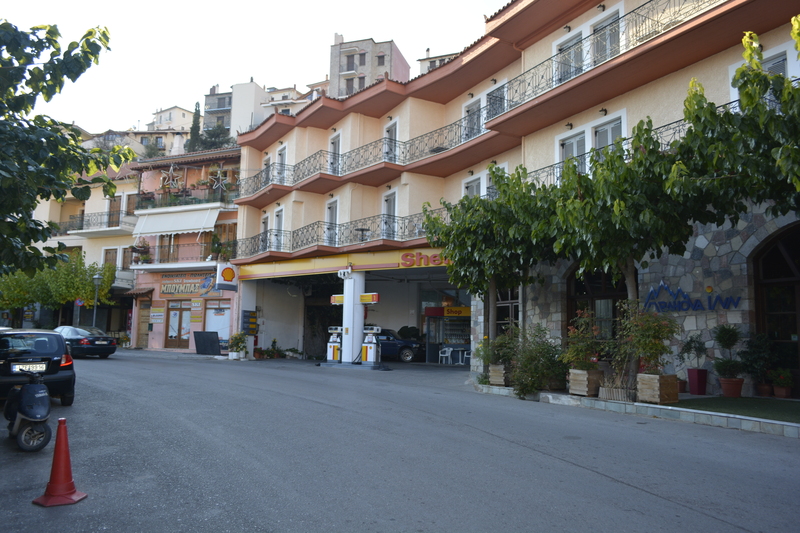 The next morning I was up early for the 7:30 pick-up for the trip to Mycenae. 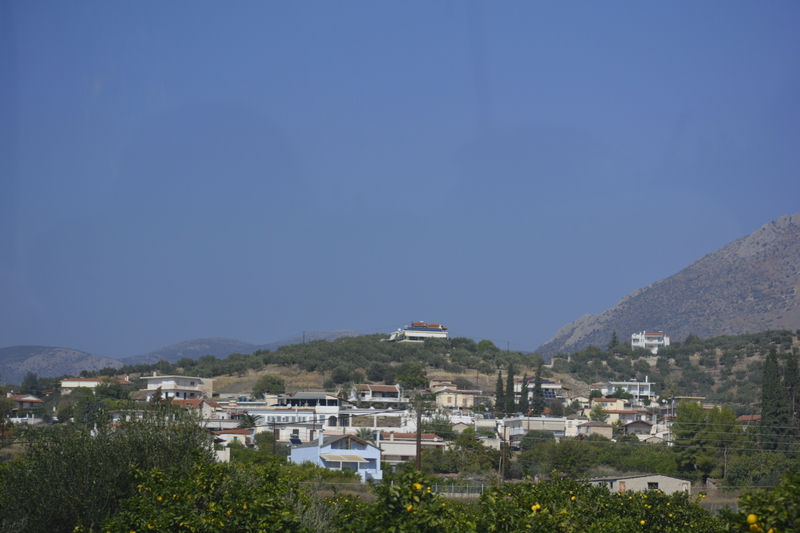 After stopping a various hotels in the area, we were off to the Peloponnese, the large peninsula south of Athens. The trip is another reminder why I generally like to travel on my own and not have to rely on someone else to plan my day. Our tour guide is a bored woman of about 60 who has obviously made this daily journey far too many times. 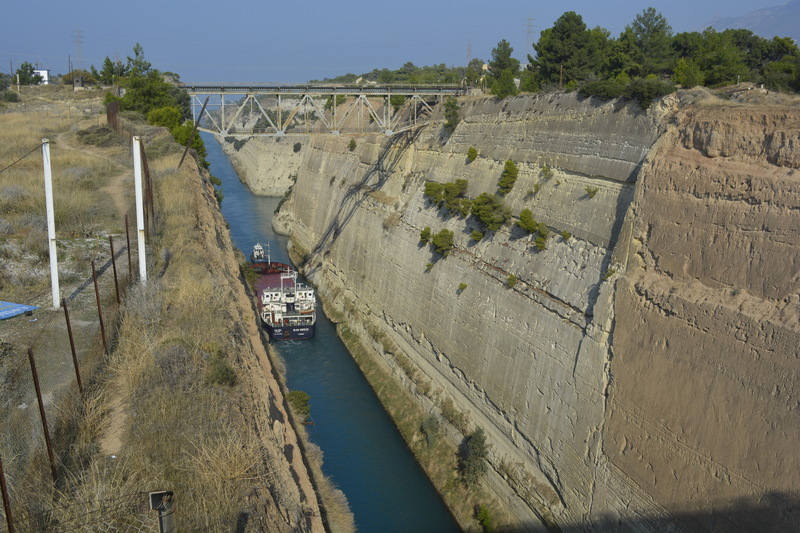 We first stopped at the Corinth Canal, which joins the Ionian and Aegean Seas. It was dug in the late 19th Century. Unfortunately, it is clogged by tourist shops selling everything from post cards to beach towels. Mercifully, we didn’t stop here long. 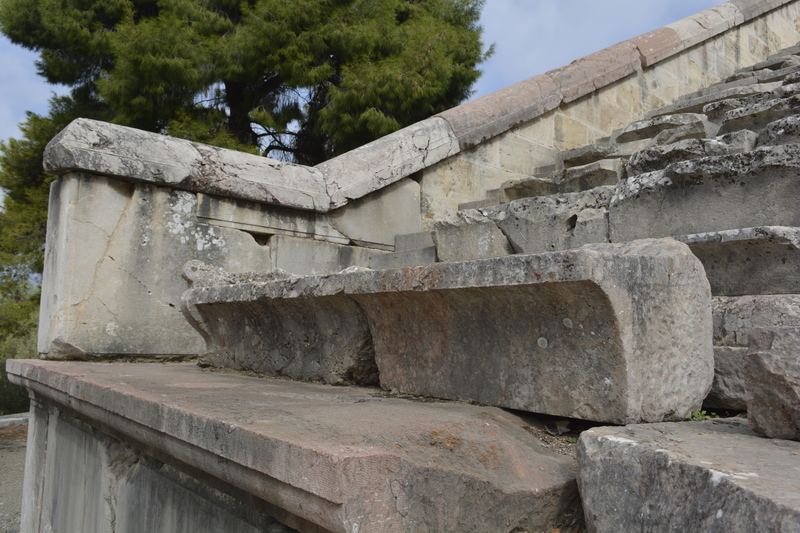 Then we were off to the magnificent Epidavros, an ancient healing center in the north-eastern part of the peninsula. Much has been destroyed here over the constant invasions from Romans, pirates, and northern “barbarian” tribes. 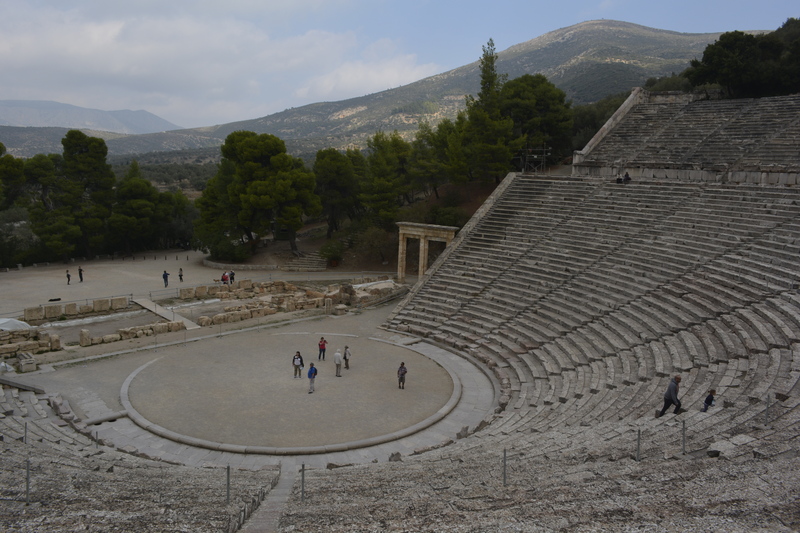 However, it does have one of the most incredible theatres built in the 4th century BC and then enlarged by the Romans. This theatre holds about 15,000 people and the acoustics are amazing. The use of certain stones at the base and the extension enabled the patrons to hear even low-voiced delivery clearly even at the top! I went up to the top with several others and listened as people below conversed in natural tones— all very easily heard from our perch! 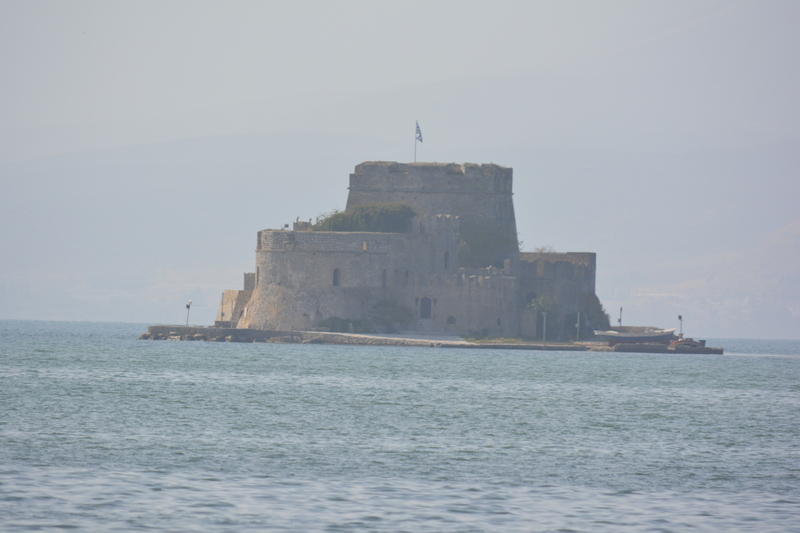 On our way to Mycenae, we took a side trip to Nafplio, the first modern capital of Greece after the country achieved independence from the Turks in the 19th Century. We quickly drove through the small city to the seacoast. We stopped at a refuse cluttered area near the railroad tracks. 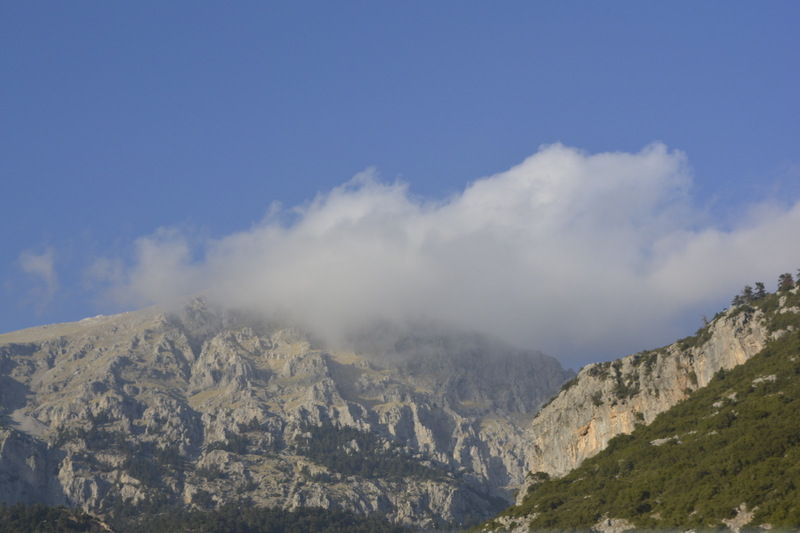 The day was hazy, but we were encouraged to get off the bus to see the acropolis of the town high above and the remnants of two fortresses, one built by the Venetians. I wasn’t the only one bewildered as to why we stopped here for 20 minutes. You really couldn’t take any pictures as it was extremely hazy and we were quite a distance from any of these sites! 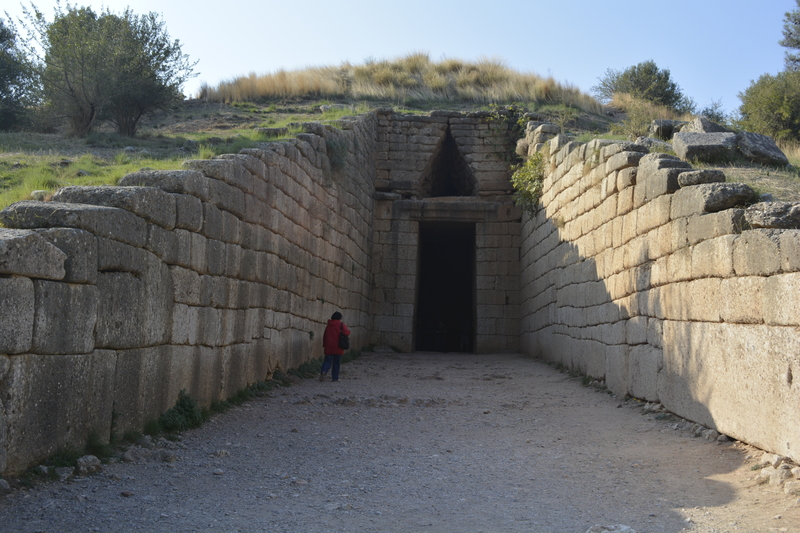 This time lost became important when we final got to Mycenae shortly thereafter and discovered that, as it was now November, the site closes at 3PM. This gave us a little less than an hour to see the whole site! 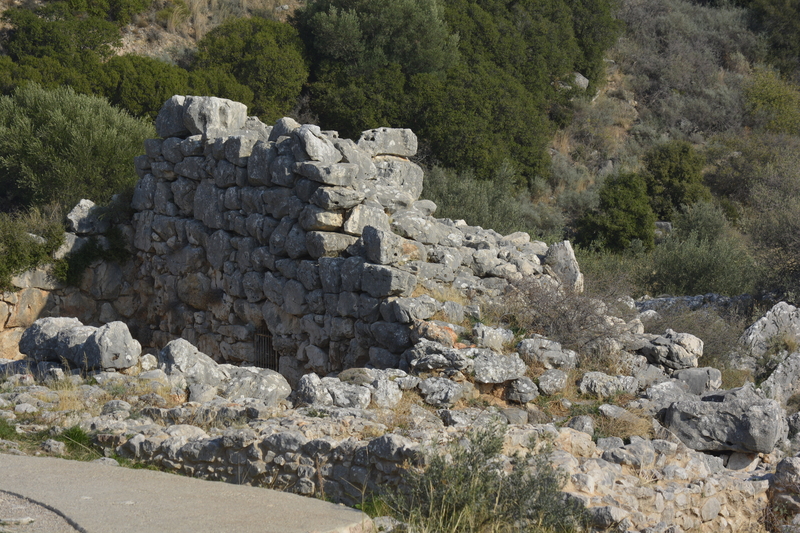 This was an important stop to me because it is from here that the Greeks began their quest to conquer Troy. When you get off the bus, you have to walk a short distance uphill to the entrance to the site. It is here that you pass through the main entrance to the old city called the Lion’s Gate. It is not only astounding because of the magnificent carved lions at the top (a symbol to the power of the city), but also the huge, fitted stonework that makes up the walls. 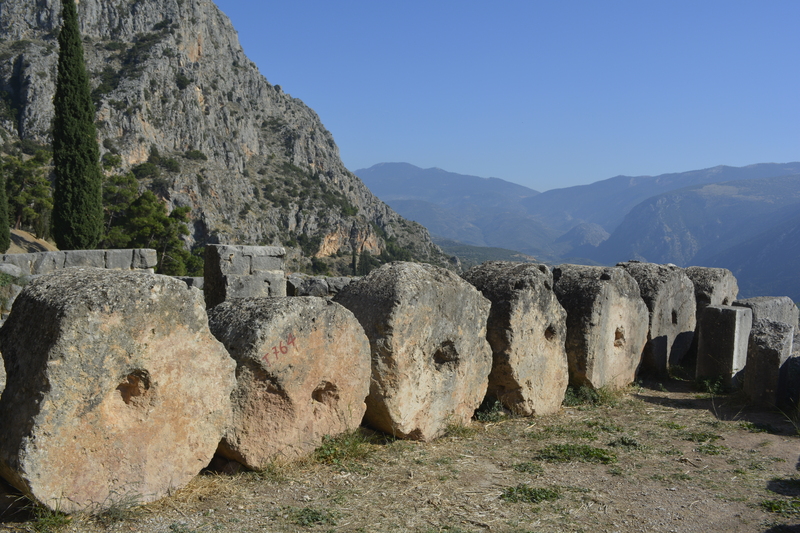 In fact, in ancient times, it was referred to as “cyclopian” because the stones are so large that it was believed that only the huge Cyclops could have moved them! 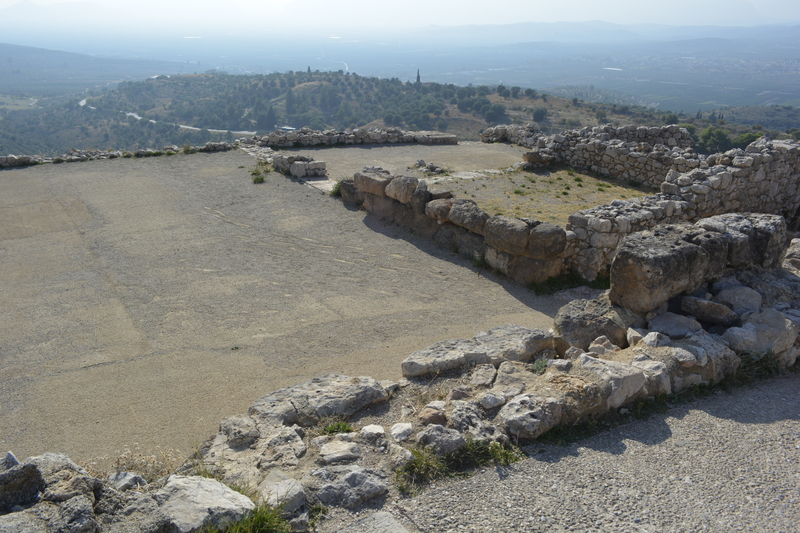 As time was short, I left the guided tour to get to the top of the site (the Acropolis). As you walk past the gate, you see a wall on your left and right. 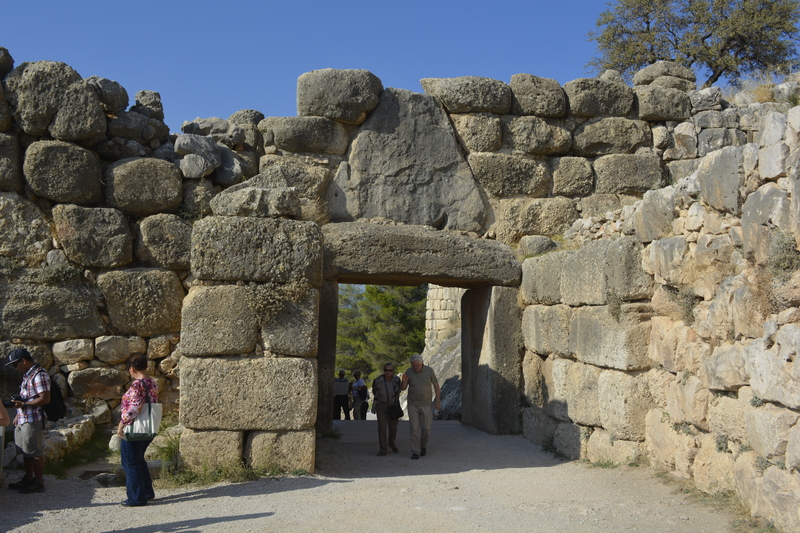 This must have been a formidable site to those who entered the gates in the 17th to 12th Century BC! It was meant to be so– to attest to the might of the city itself. 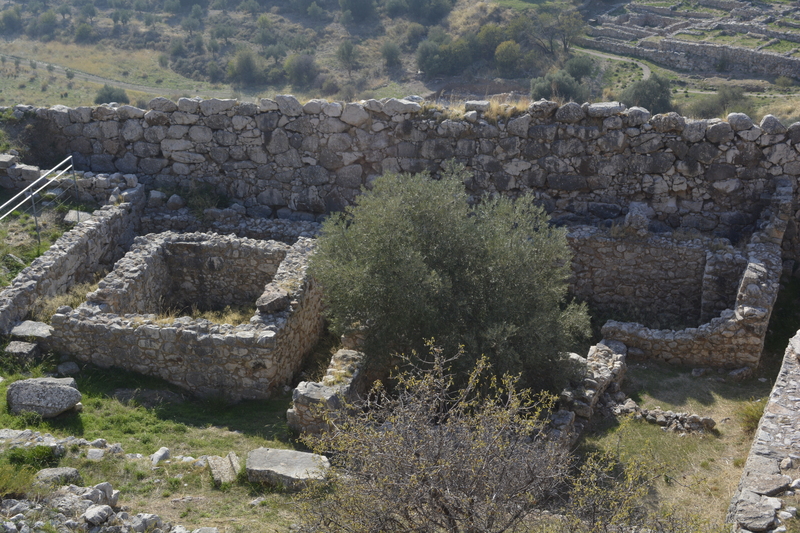 You then come to the remains of the granary and the royal 16th century BC tombs. 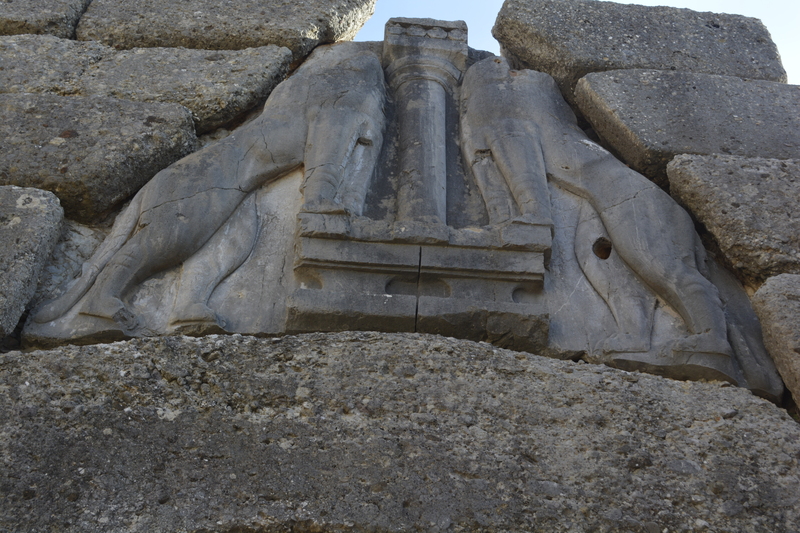 It is here that Schliemann found the so-called death mask of Agamemnon, the king of Mycenae and brother of Helen of Troy’s husband, who conquered Troy. In reality, the mask was dated to a time a few hundred years earlier. It is amazing how compact the city must have been. 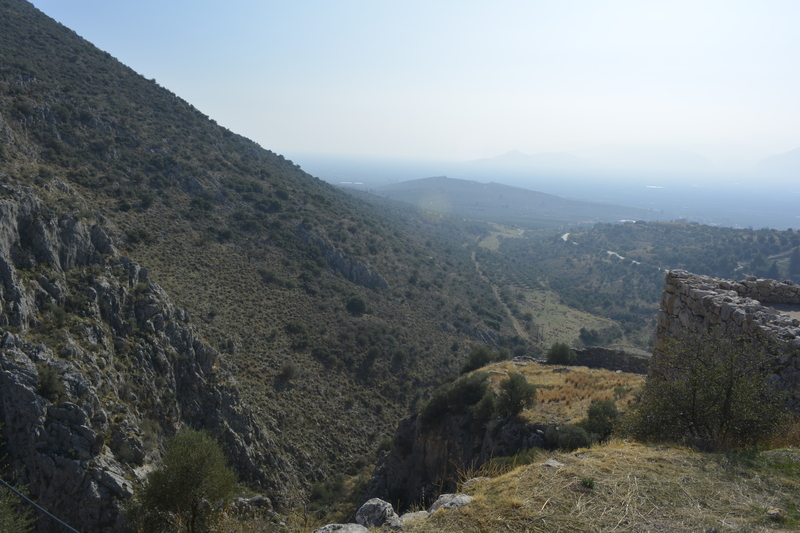 When you make your way to the top of the acropolis to the very ruins of the ancient palace, you realize how breath-taking the area is. It was quiet as only a few people were there. It is both a visual and auditory feast to experience! The site has a commanding view of the valleys and hills below. The shadows of clouds rolled over the bare landscape. 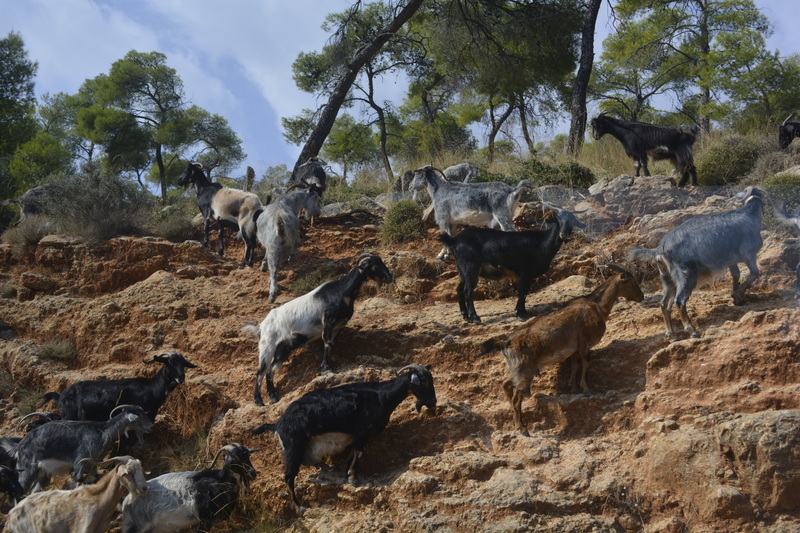 You can close your eyes and meditate on the sounds of the bells ringing from the necks of the sheep grazing on the adjoining hills under the watchful gaze of their shepherds. The wind whips its way over the contours of this magnificent site, and whistles around the stones, formations and people it finds in its way. I was just getting into this comfortable “zone” to meditate when someone from the group reminded me that we had to get back to the bus. 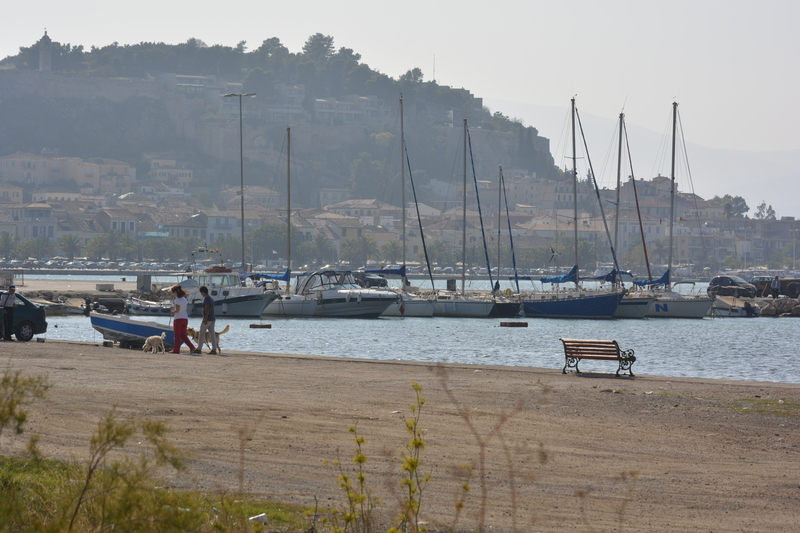 The time here was much too short, and I again wondered, along with the few others who also made the trip to the top of the hill, why we had stopped at all in Nafplio taking precious time away from this fantastic site. 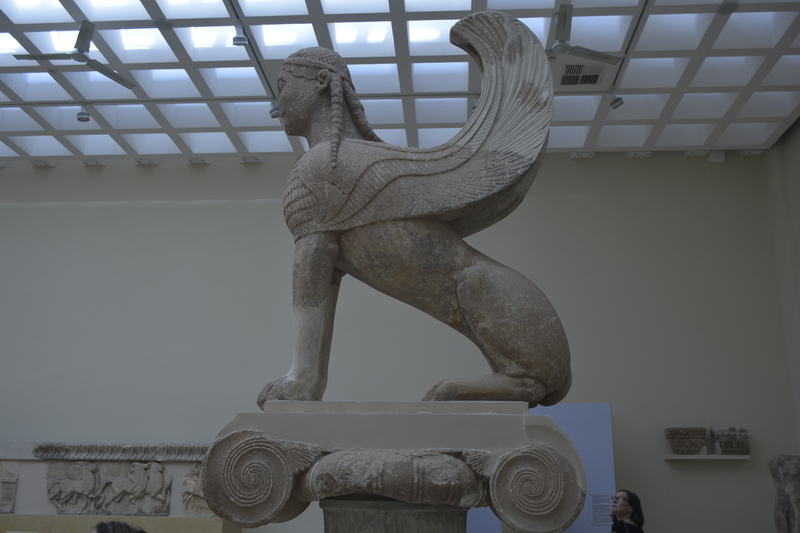 We had no time to see the museum, but I understand that most of the important finds were at the Athens Archeological Museum anyway. 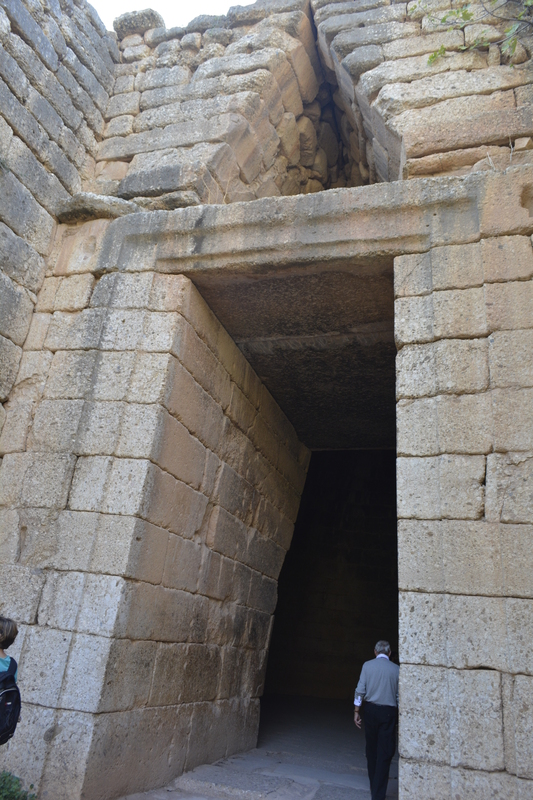 As we left the site, we stopped at the Treasury of Atreus. This is an amazing beehive-shaped structure built into the side of the hill. I am again stunned by the stonework. 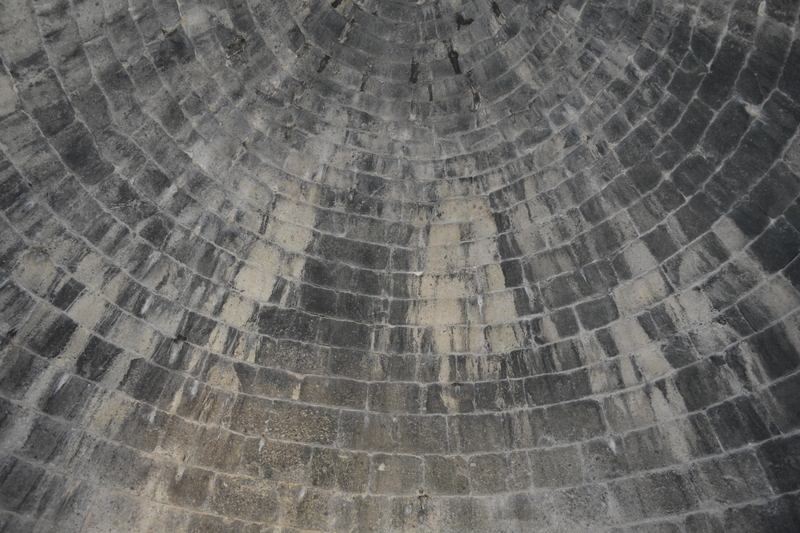 Considering it was built circa 13th Century BC, I wondered how they managed to construct this with the perfect cone shape of such tight-fitting stones. 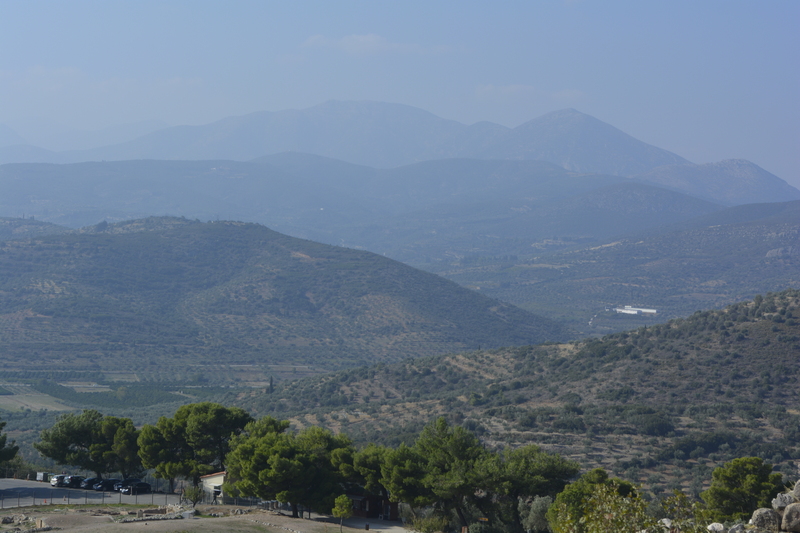 I went ahead of the tour entering the tholos and marveled at the sound magnification created by simply scuffing your foot along the dirt floor. Looking up at the ceiling, I was in awe of its perfection. After a quick, very late lunch we headed back to Athens. 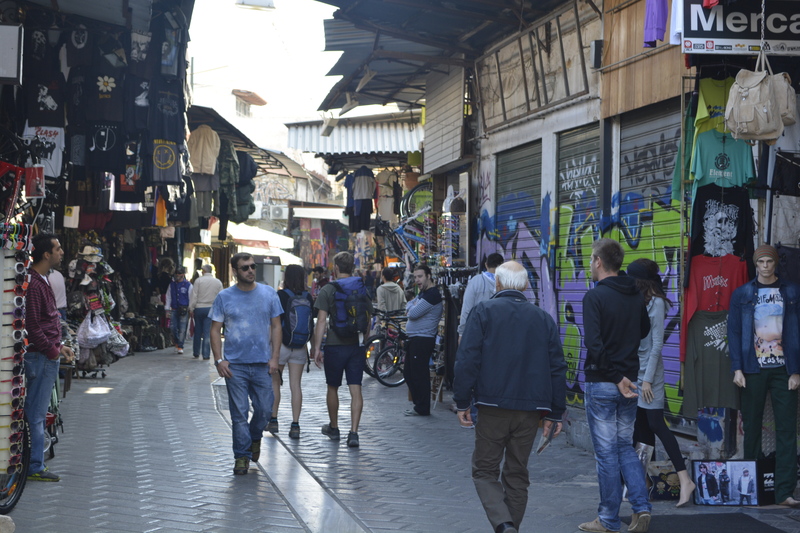 When I saw the Omonia area, I knew where I was and got off the bus making my way back to the hotel—- but not without wandering first through the side-streets, of course! Travel is always much more interesting the slower you go and the further off the main road you manage to permit yourself to venture– not unlike life in general! The last full day in Greece! And off I went on another guided tour. 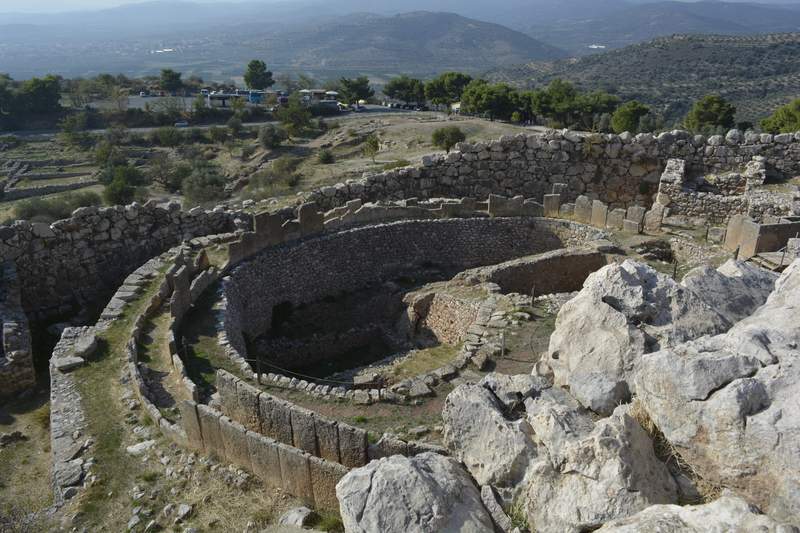 (I had gotten a great deal on both the Mycenae and Delphi day tours as it was the end of the season and the tour company was anxious to fill its buses!) What a difference a knowledgable, engaged tour director with a good PA system on the bus can be! 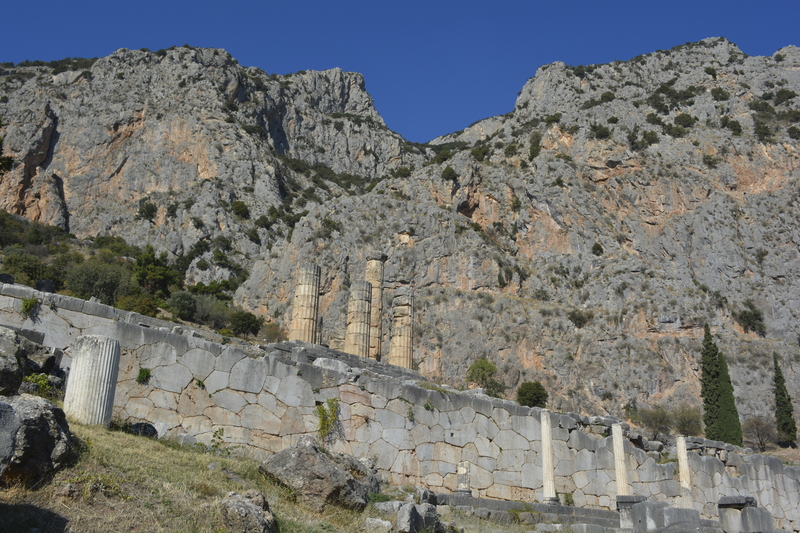 The trip to Delphi took about 2 1/2 hours. 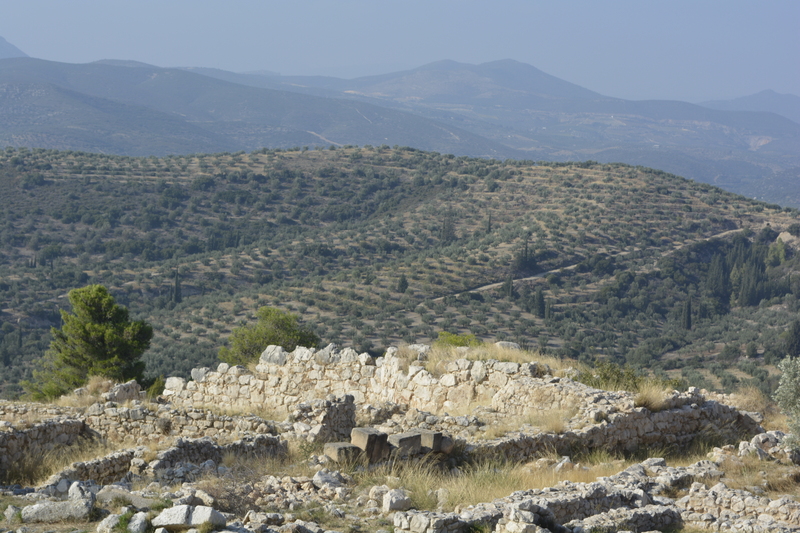 We saw the field of Marathon, 26 miles west of Athens. It is here that the Greeks won an important victory against the Persian armies. One of the soldiers ran in full armor all the way to Athens to make the announcement to the nervous population awaiting news of the battle. As soon as he gave the news, he reportedly fell dead from exhaustion. 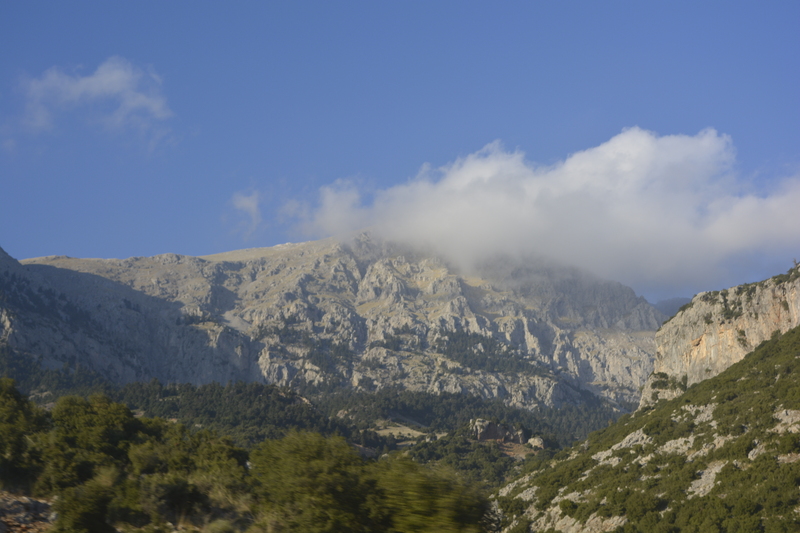 We drove past the city of Thebes and fields full of cotton. It must have been harvest time as we saw trucks loaded with cotton and the white, fluffy tuffs blowing along the side of the roadway. 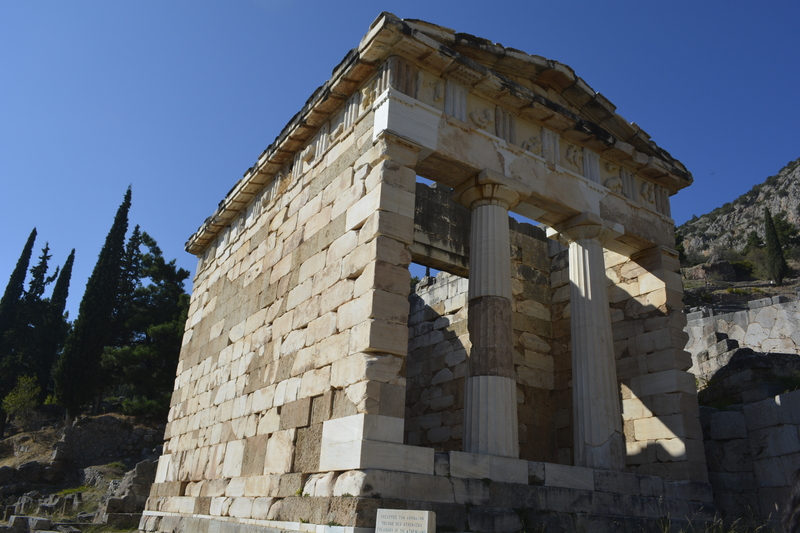 When we arrived at Delphi, we hit the ground running straight for the museum. Our guide was hell-bent on getting ahead of another, larger group! She knew her stuff and the tour was thorough and interesting. 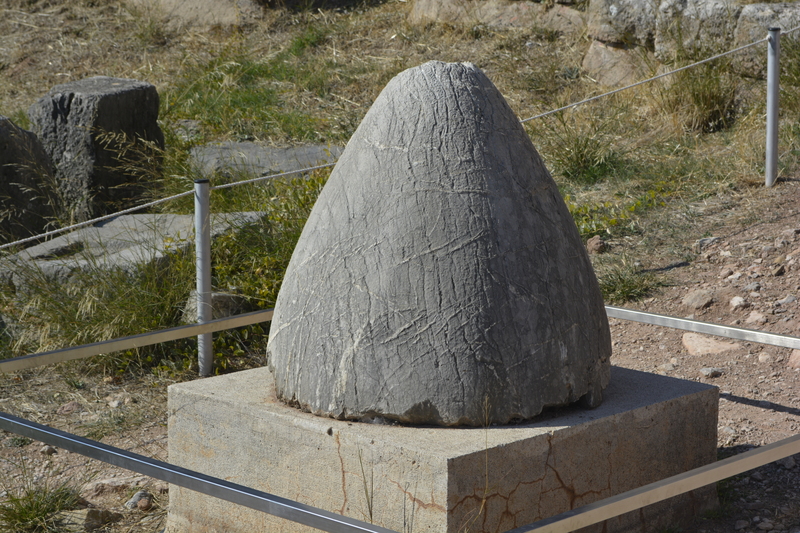 I was so happy to see a museum outside of Athens that had so many of its own artifacts still on site! However, I was getting concerned that we wouldn’t have enough time to see the site itself. 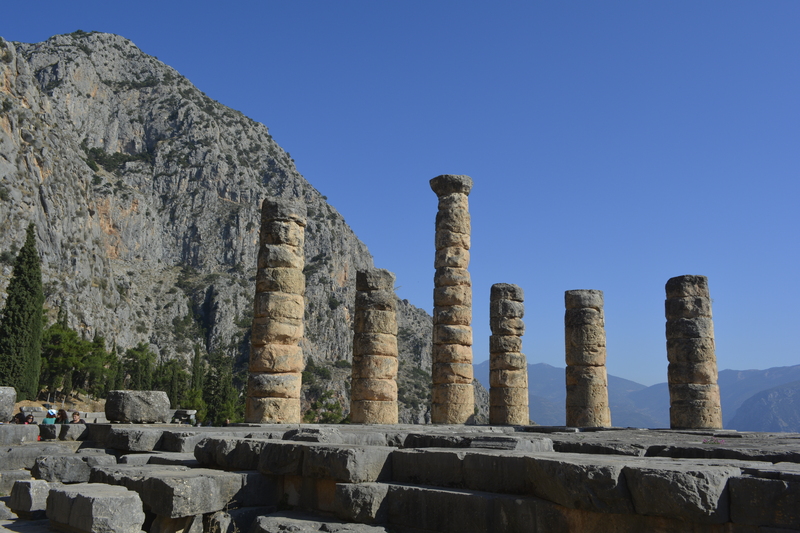 Delphi was considered the center of the world in ancient times. The story goes that Zeus let go two eagles and commanded them to fly in opposite directions. 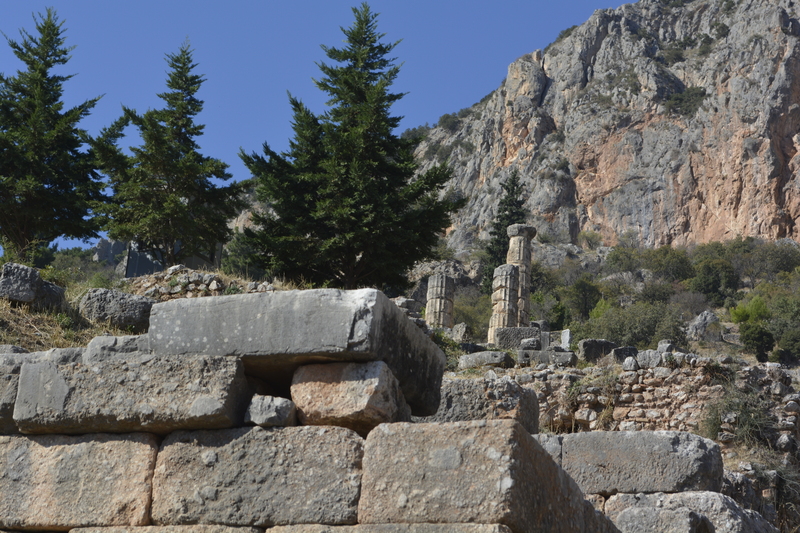 They met again at Delphi. There are still dome-shaped structures there that indicated that this was the navel of the world! 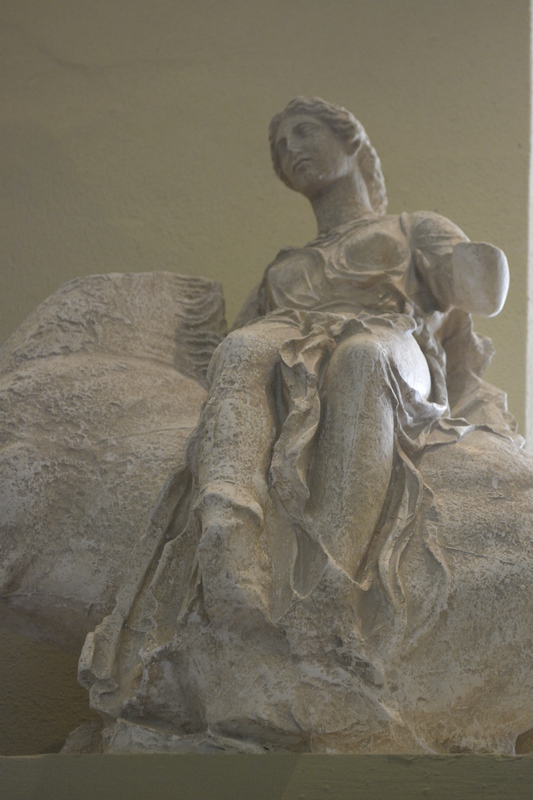 The oracle of Delphi was chosen from among the elderly women from nearby towns who were thought to be wise. She would communicate with Apollo to seek his advise. 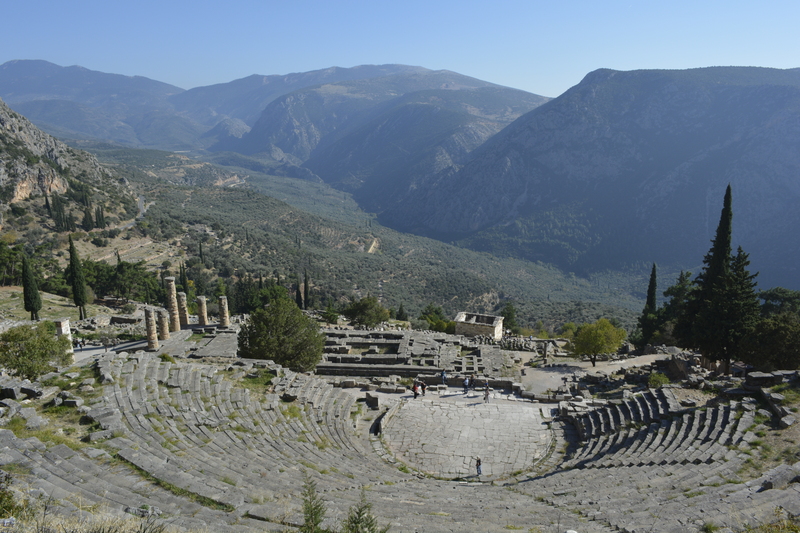 Not much happened in ancient Greece from war, trade agreements to important journeys without first consulting the Oracle of Delphi. You would think that this is tremendous power to put in the hands of an illiterate woman from the countryside, but in actuality the oracle would speak, but the import and interpretation of what she was saying were in the hands of the high priests. 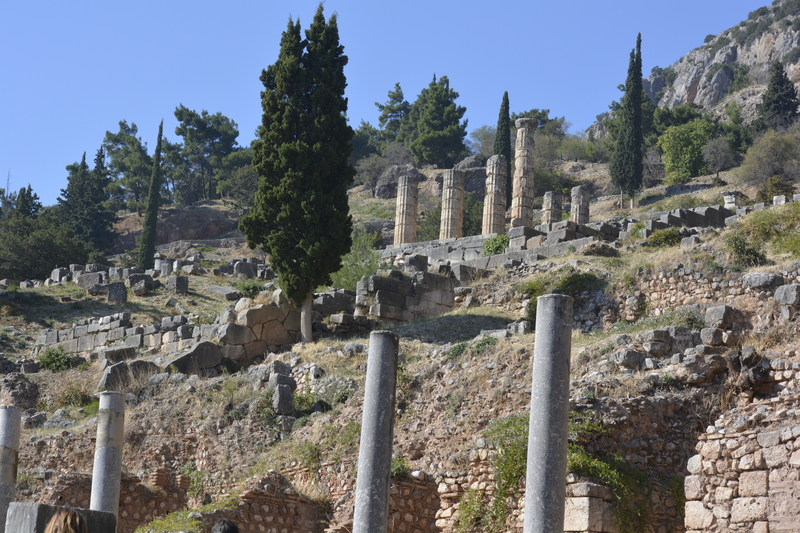 The Greek city states brought great wealth to the temple at Delphi. So much so that each state would have a treasury where fellow citizen visitors would leave their offerings. Magnificent temples were built to honor the gods, especially Apollo, by those currying their favor, or those whose entreaties were realized. Many of the temples, however, were brought to dust by earthquakes and later, neglect. In its time it became a large and important site. There were even public games, Phythian Games, that were second only to the Olympics themselves in importance. When we finished with the museum, many of us made our way to the stadium at the top of the hill. We walked past the temples, theatre, and treasuries that are now gone, in ruin or reconstructed from the originals. The view of the valley is wonderful. 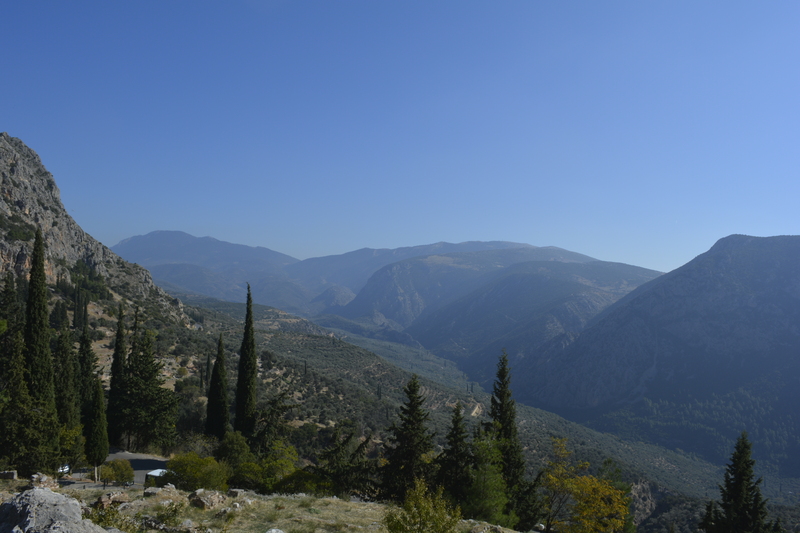 The climb up this part of Mount Parnassus is steep, but you stop often to take in the ever-changing view, so it is actually not so bad. 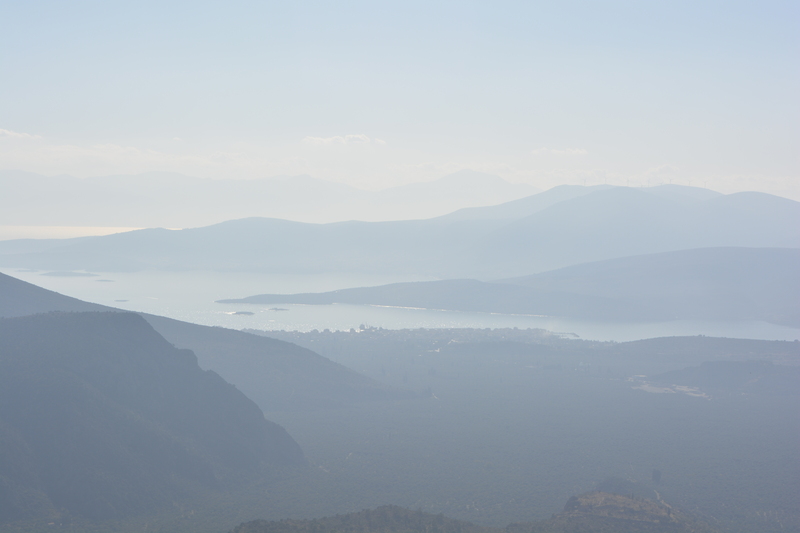 When we got to the top, I was disappointed in that I thought we would have a good view of the Gulf of Corinth. Unfortunately, that was not to be. Those of us who made the climb, made our way back down to the gate and on the bus. I really have to say that I think we had just the right amount of time here, but it would be nice to return someday and explore other areas nearby. 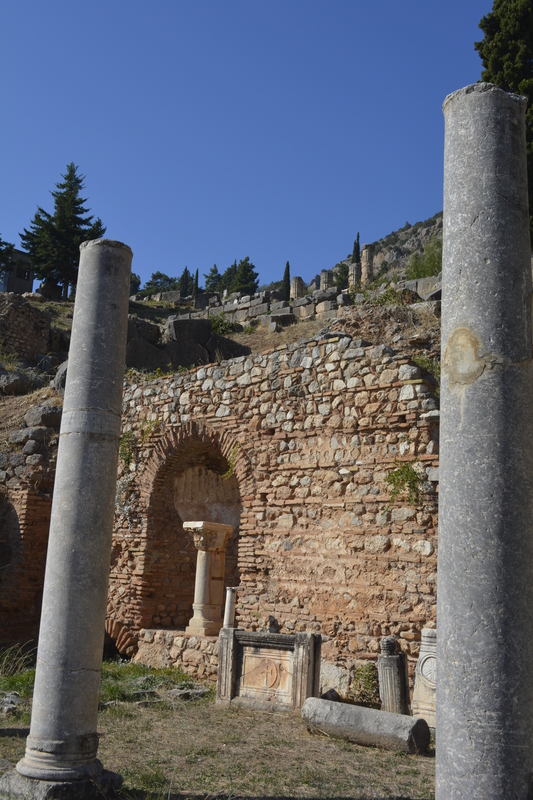 We had lunch in the modern town of Delphi. I did not prepay for lunch, so I brought my own and asked at the restaurant where I could go to eat. They directed me to a garden outside the restaurant itself. And there, lo and behold, was a chair and round wrought iron table under a tree——- with a spectacular view of the Gulf of Corinth below! 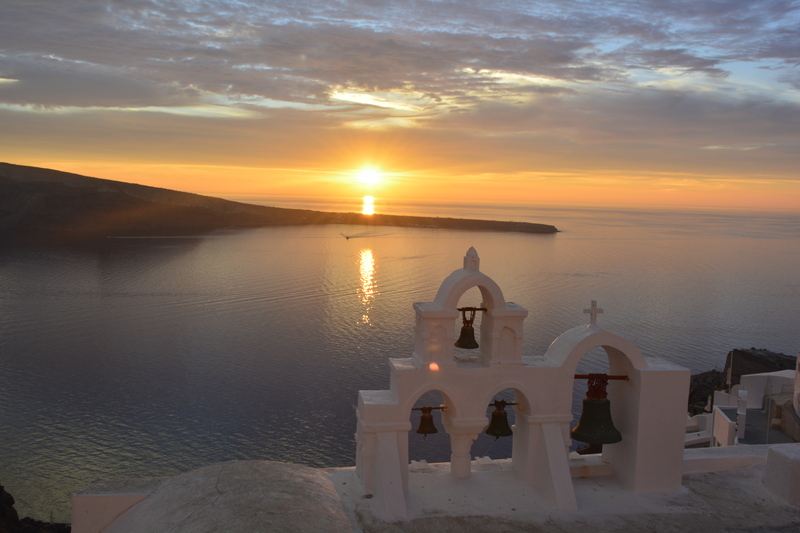 I’ve often said that this whole trip through Turkey and Greece was magical—– and here the last full day, magic again! Some of the people on the tour made their way out to take in the view after lunch. 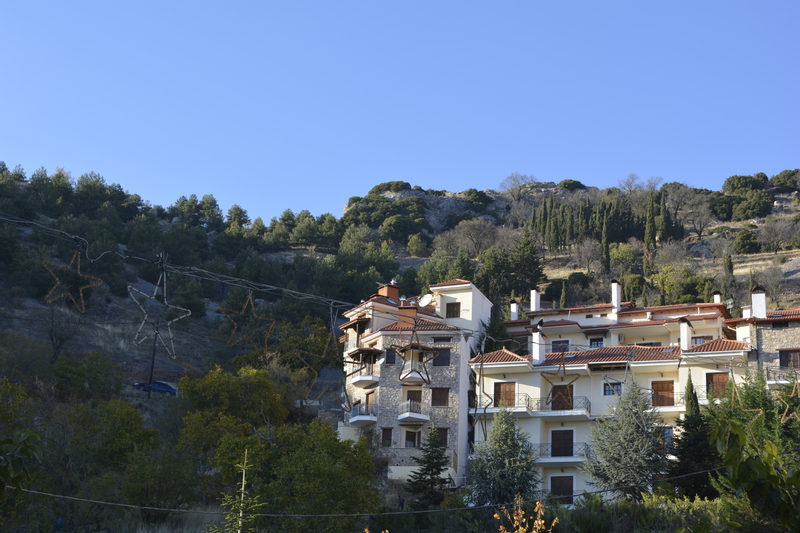 On the way back to Athens, we stopped briefly at the town of Arachova, a picturesque location on the hillside. 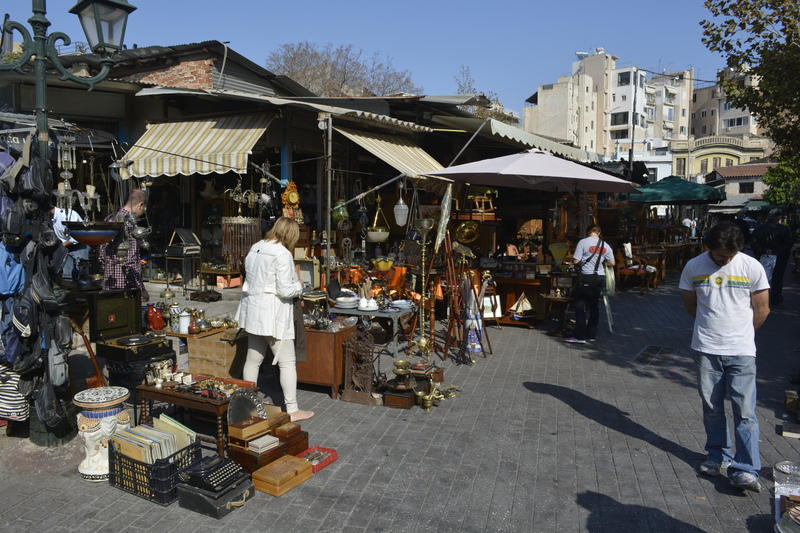 It is mostly a tourist town with lots of shops selling local crafts, but that should not take away from the fact that it is an interesting, quiet, and relaxing town in its own right. 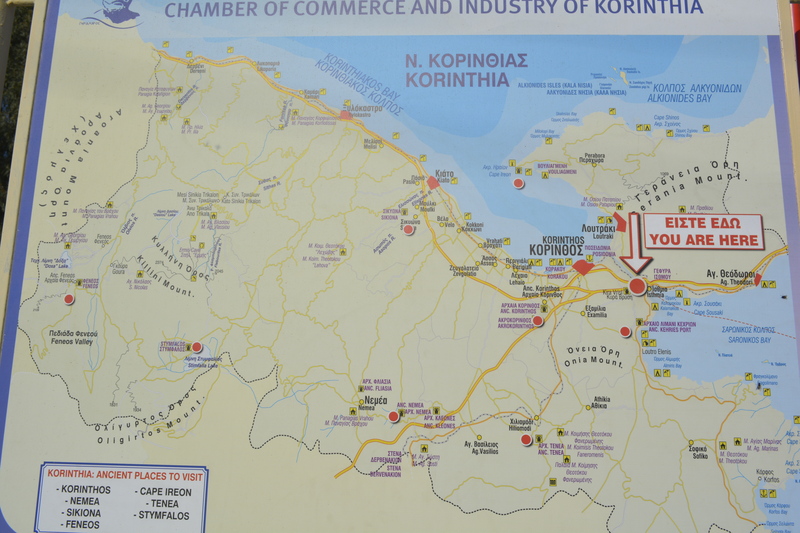 When we got back to Athens, I got off in the Syntagma district and walked back to the hotel. I stopped at the small cafe across the street from the hotel. The food was wonderful. I talked to the waitress. Her English was quite good, but she was actually from Albania. A few others joined in the conversation. I was sorry that I had not found this little gem of a place before! I got back to the Apollo and finished up packing. I was up early and out at 5:30 heading for the airport by the Metro. It took only one subway change at Syntagma station. One hour later, I was at the airport. The cost is about 8 euros as opposed to the taxi that would set me back about 60 euros and would have had to suffer through unknown traffic as well! Long Island Railroad take note— every car of the airport-bound subway had a space to leave your baggage. The flight was scheduled for 10:00, so I had a little time to wait before check-in. 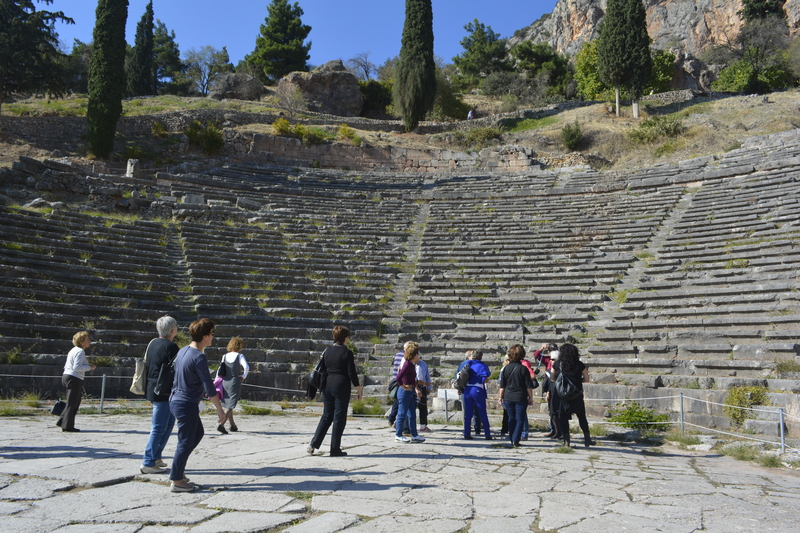 As I approached the row of seats to wait, I saw a couple I had met on the tour to Delphi the day before! We sat and talked for a while and then they were off to return to Australia. Not long after, I found myself through the gates and on the plane for the one-hour flight to Istanbul to make my connection to New York. About ten hours later, I was in cold, rainy New York waiting for the train to Patchogue and home. Got home about 12:30 am and do not really recall my head hitting the pillow to sleep……. 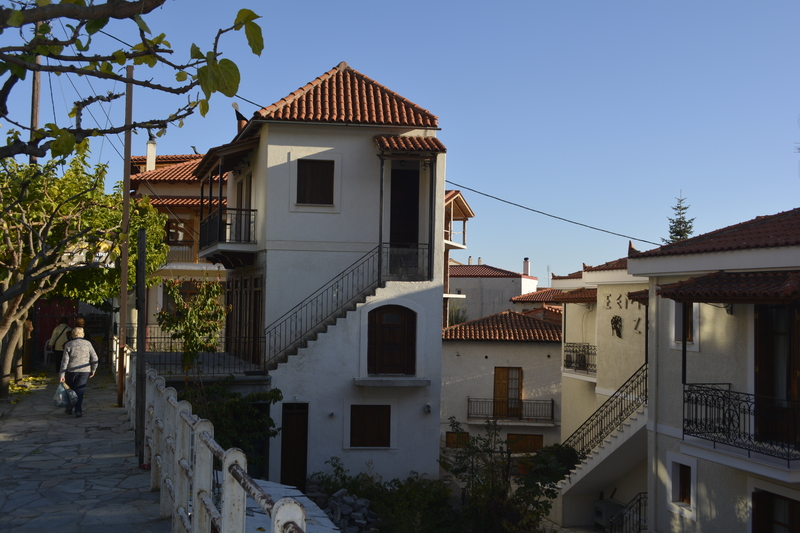 and I no doubt dreamt of my magical month in Turkey and Greece. 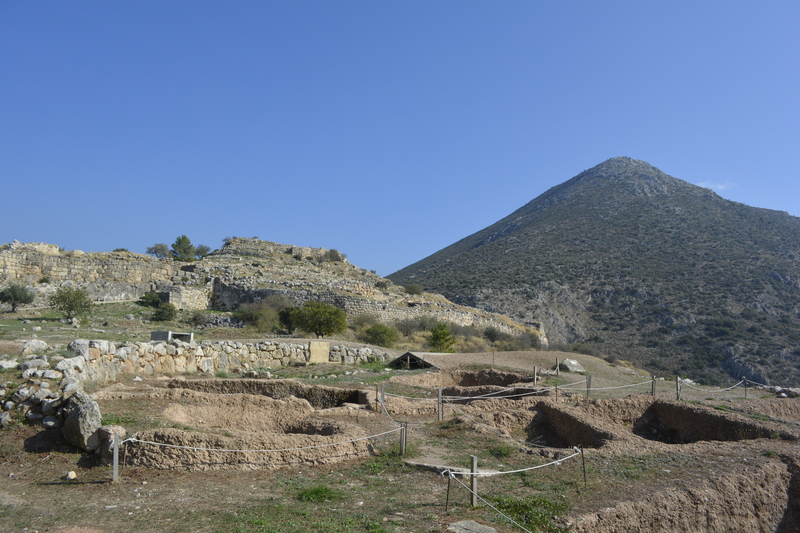 This entry was posted in Uncategorized and tagged Acropolis, Aegean Sea, Ancient Greece, Athen, Athens, Corinth Canal, Delphi, Greece, Greek, Gulf of Corinth, Mycenae, Mycenaean Greece, Nafplio, Treasury of Atreus. Bookmark the permalink. Love it Paul, can’t wait till the book comes out.